1. Box: Rectangular cardboard box that opens at each end. Red cardboard. Gold pattern framing brand name "Cussons / IMPERIAL LEATHER / TOLIET SOAP" in red font on white background on top and bottom. Imperial Leather motif in centre. Angled sides one with white horizontal pattern with Imperial Leather motif in centre and the other with white lettering "TOILET SOAP by Cussons / MADE IN ENGLAND", identical on other side. On each opening end has white lettering "IMPERIAL LEATHER / TOILET SOAP / 84, BROOK ST, GROSVERNOR SQUARE, LONDOON W.1." Contains two rectangular boxes which hold soap. Size suggests that it would have contained three boxes. 2. Box: Rectangular cardboard box. Red and cream cardboard. 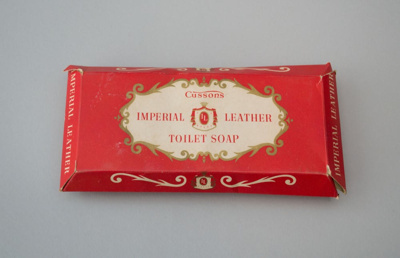 Top depicts Imperial Leather motif and "Cussons / IMPERIAL LEATHER / TOILET SOAP". Bottom is identical. Sides have red lettering "IMPERIAL LEATHER / MADE IN ENGLAND" One side is hand written on in blue pen but not completely legible (A 1/11 1/2?). Box is sealed, has never been opened. 3. Box: Rectangular cardboard box. Red and cream cardboard. Top depicts Imperial Leather motif and "Cussons / IMPERIAL LEATHER / TOILET SOAP" Bottom is identical. Sides have red lettering "IMPERIAL LEATHER / MADE IN ENGLAND" Box is sealed, has never been opened.